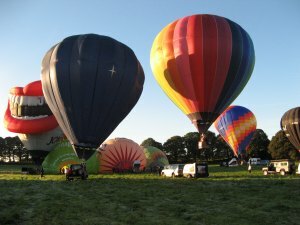 Every year the Irish ballooning fraternity hold the Irish International Balloon Festival at different venues around the country. 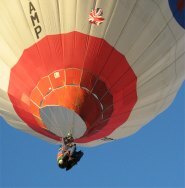 These meets are well attended by balloonists from all over the world, and are really good fun. Various elements are brought into the competition such as fly close enough to a pole in order to grab a hoop from the top of it, lower a bucket from a balloon to catch a fish from a lake, "splash and dash" (decrease altitude so that the basket just dips into a lake or river and then gain altitude again), land as close as possible to a balloon which set off 15 minutes earlier, and so on. At Albuquerque, prizes for winning such competitions can be quite attractive; SUVs for instance. Fortunately at the Irish festivals, no one takes them too seriously, indeed points are deducted if you try too hard; Irish logic for you. The social side of the event is as important, if not more important, than the ballooning. It was the 2003 33rd Irish Festival held at Kells where I had my first balloon ride; in at the deep end with a weeks worth of ballooning at an international festival! I remember my first flight well. The balloonists congregate around 05:30 for a weather update and information dissemination. The weather forecast from the airport was for wind speeds to be around 12 knots and falling. Kevin and I took off into the morning sun, and I was euphoric at the splendor of rising gracefully to meet the morning sun and drift as one with the wind. I had expected to be over the moon with my first flight, but this was beyond that. On route Kevin spotted a stretch of water and suggested we go for a splash and dash. The wind was a little faster than he thought and he misgauged the descent and we hit some hard clay instead of the water. I was unprepared for how hard the impact would be, but we were traveling at an appreciable horizontal speed. We quickly regained height and carried on. I gradually became aware that Kevin was growing a little concerned. The wind speeds, instead of falling, were actually picking up, alarmingly. Tony, who was doing the retrieve, couldn't keep up with us and we completely lost him. After many miles, our gas supplies were dwindling, and Kevin felt we ought to come down pretty soon. He spotted a field in the distance which didn't have power cables running across it and made a decision that was the field to go for. However, our speed was around 25 knots by this time, a bit fast for landing. The only way a balloon can be slowed down is via a controlled "crash", namely hit a hedge or the top of a tree with the basket to take out some of the momentum. Well, we hit a hedge but just punched a hole through it. We then tried a tree that was conveniently in our way, but our speed was such that we nearly gift wrapped it. We eventually popped out of the top of the tree like a cork and Kevin just yanked the rip cord to get us down. We landed hard, bounced and landed even harder. The landing completely winded me and I was a bit sore. Once we had packed the envelope away, we went to seek the farmer to get his permission to bring a vehicle and trailer onto his field in order to retrieve the balloon. We had problems with mobile communications at the time, and needed to make some phone calls in order to find where our retrieve team was. We mentioned this to the farmer, hoping the farmer would allow us to use his phone. He gleefully pointed out that there was a phone a couple of miles away at a pub. That was a painful two mile walk. I had some physical discomfort for the rest of the week, which I put down to bruising. After a week back home I knew this was something more then bruising, and went to my local hospital. Turns out I had cracked a couple of ribs. Not bad for a first flight. 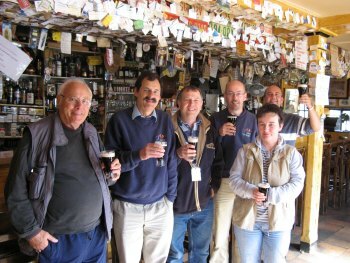 The 37th Irish Festival in 2007 was held at Athlone, a vibrant friendly town located in County Westmeath in the centre of Ireland on the banks of the River Shannon, with the lovely Lough Ree close by. 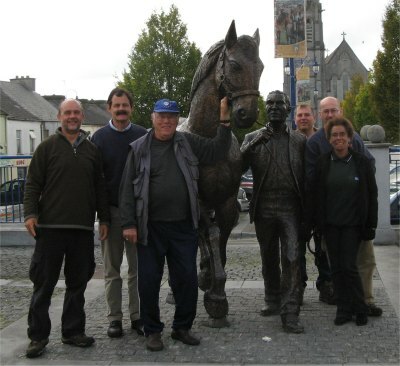 During an idle moment, we took the chance to explore the town and meet one of the locals with his horse. The team, shown opposite, comprises from left to right: me, Tony Gould, Derry Moore, Kevin Dodman, Niall and Liz Rowan. Derry, the scouser, is a world renowned balloonist and a leading figure in British ballooning. He is also an inspector; one of that rare breed who travel all around the world inspecting and certificating balloons and associated equipment. An amazing guy who is still flying in his eighties, a really nice chap with the unmistakable scouse sense of humour. One evening Derry recounted an episode from his past when he was once approached by a Swedish businessman who had made his fortune out of steel. The Swedish chap, who owned a very large yacht in the Mediterranean, wanted some balloon lessons out there. Derry obliged. This progressed to the business chap wanting to entertain guests on his yacht with balloon flights - yes balloon flights from a yacht. Derry was roped in to being the pilot. The idea was to motor the yacht at the same speed and direction as the wind so that the balloon would effectively take off vertically from the yacht. After time in the air, the yacht would position itself below the balloon allowing an almost vertical landing. I presume an ingenious method of inflating and also gathering in the balloon envelope had been devised. As time went by, and more guests were taken on board, the businessman wanted a membrane placed around the basket so that it would float in the sea. This enabled the balloon to be launched, and at intervals it would land in the sea (still keeping the envelope inflated of course) where a motor boat would deliver some new passengers and collect previous passengers and return them back to the yacht. This service carried on for quite some time, until the businessman got bored and decided to sell the yacht and move on to other modes of amusement. The yacht was sold, complete with crew, to another business chap from the UK. The new owner had an acerbic, aggressive nature, and the crew soon deserted to greener pastures. The said owner is a well known UK entrepreneur who has appeared on TV a lot. Enough said. Despite it still being September, it was surprising to find frost on the ground at 6am. I guess Ireland is entitled to plenty of frost as well as rain. Here we have the usual intensive pre-flight checks being carried out. At some balloon festivals, there is an obligation to carry a sponsored passenger on one flight. On this particular occasion we had a lady passenger, who worked for the local council and had won a raffle for a free flight. She enjoyed a beautiful morning flight, and after the retrieve, we all retired to a village pub for the usual post flight beverage (and usually breakfast; many Irish pubs served up cracking breakfasts) plus chin wag. This pub was on a well trodden travellers' crossroads, and over time had acquired the tradition of displaying people's business cards all over the pub, as can be seen in the photograph. I left my own card there; DNR Solutions Ltd if you ever feel like looking for it. Passing through an arch in the pub one enters the local grocers. We found this concept of the building serving two purposes unusual. However, our passenger (shown front right in the photo) explained that this wasn't at all strange. When she was a child, her parents ran a pub, and it was very common for publicans to also act as the local undertaker. Flights occur early morning or in the evening to avoid the midday thermals. During the afternoons, people would go exploring, and partake in various activities arranged, such as treasure hunts or barbecues. 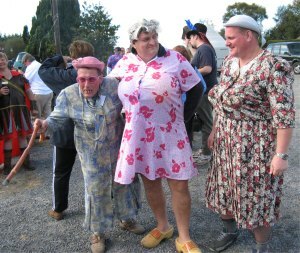 The Irish festival meets go to town on their annual barbecue, and fancy dress is optional. Here we see Nigel (with stick) and some of his team before they 'wow' the passing lorries. Crusader (Daily Express) is having a strong burn here to climb up into the grey skies. Balloons don't always need baskets. Sometimes the balloonist is suspended below the envelope in a bosun's chair with the gas tank strapped right behind him, as shown here. This must give the ultimate sense of freedom, but crumbs, at what price, you have not got the protection of the wicker basket when you come in for a hard landing. Quite a few Americans come over to these Irish balloon festivals and use the bosun chair approach, and they travel really light. They will combine the balloon envelope, burner and bosun's chair into their hand luggage, and just hire the gas tank at the meet. Any clothes etc required are bought locally. I should try and take a leaf out of their book sometime. Athlone is mostly surrounded by lush emerald green countryside with a scattering of loughs and rivers. However, you don't have to go far afield to come across huge peat bogs which are being commercially exploited to supply fuel to a local power station. Peat bogs are not good places to land in! On one flight I espied a very long straight rail track; in fact it seemed to carry on over the horizon, and can just be made out in this photo. 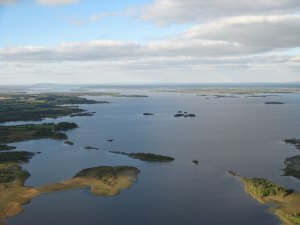 During our stay in Athlone, we rented a bungalow quite close to Lough Ree. 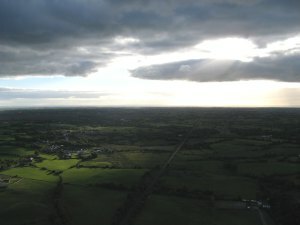 Here is an aerial shot taken on a flight passing close to the lough. This is the flight where they let me launch the balloon, and I nearly ripped the top off a car in the process! After the evening flights, balloonists tend to socialise in a pub or restaurant, and swap stories. It was at one of these evenings where I heard a wonderful tale. The narrator recounted how he had once been over in Ireland at one of these meets, and had been completing a solo flight. No sooner had he landed in a field, when the farmer appeared, a small, old, wiry fellow, dressed in a coat that reached his ankles, with a broad grin. He was over the moon at having a balloon land in his field. 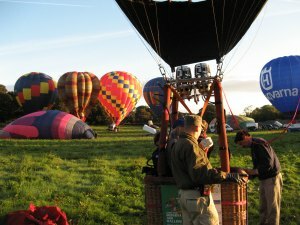 The pilot was so taken aback with the farmer's bubbly enthusiasm that, since he hadn't completely collapsed his balloon and knowing he had the time and fuel resources at hand, offered to take the farmer for a short flight across a few fields. The farmer said that would be grand, and hopped in. As they climbed, the pilot asked the farmer what he thought of seeing his farm from the air. The farmer replied, "Oh, 'tis a grand t'ing, to be sure, a grand t'ing", with the same huge grin on his face. After a few fields, they were starting to approach a lough, and the pilot asked the farmer if he would like to fly over it. "Oh, that would be a grand t'ing, to be sure, a grand t'ing", beamed the farmer. As they headed out across the lough, the pilot mentioned to the farmer the sport of "splash and dash", and asked the farmer if he'd like to try it. His grinning response was, "Oh, that would be a grand t'ing, to be sure, a grand t'ing". The pilot dropped altitude towards the lough, but hadn't appreciated that the wind speed had picked up a bit. When the basket touched the water, it more or less stopped dead, but the envelope carried on, effectively tipping the basket on its side. But with the basket touching the water, the basket is buoyed up by the water, and thus there is relatively less weight for the balloon to carry, and it then tends to pop up into the air like a cork. This is indeed what happened, and the balloon rose steadily as the pilot applied a burst of heat. The pilot then turned to ask the farmer what he though of the "splash and dash", but to his horror, the farmer was no longer in the basket. It was immediately apparent to the pilot what had happened; when the balloon had tipped on its side, the farmer had fallen out, and of course without his weight, the balloon had popped up rather more quickly than usual. The pilot instantly looked over the side of the balloon and saw the farmer far below, doing a leisurely crawl towards the shore, with his long coat still spread about him, looking up at the disappearing balloon. The pilot was by now in a sheer panic. He spotted the shore a few hundred metres away, and immediately assessed where he could bring the balloon down. Once landed, he quickly scanned the lough for the farmer, but the wind had whipped up white horses on the surface and he couldn't make out a thing. In desperation he ran through a copse to a house to summon help, but there was no one at home. He was now at his wit's end and sprinted back to the shore of the lough. As he was running past his balloon he saw the farmer walking up the shore towards him. The pilot was overwhelmed with relief and ran towards him to check if he was alright and offer sincerest apologies. The farmer looked a sorry state, with torrents of water pouring out of his coat pockets. However, as soon as he saw the pilot, he burst into the broadest grin and fervently shook hands with the pilot, saying, "Oh, the splash and dash, 'tis a grand t'ing, to be sure, a grand t'ing." This is not as far fetched as it may seem. At this 2007 meet, a balloon landed hard on a slope which caused the balloon to tip violently onto its side. Both pilot and passenger were thrown out by the jolt, and the balloon then carried on by itself!